100% complete & nutritionally balanced. Complete pet food for adult small dogs. Contains small kibbles for small mouths. Antioxidants to help support healthy immune system. With added protein to help support muscle strength. Vitamin D & minerals for healthy teeth & strong bones. With fibre from whole grains to help support healthy digestion. Vitamin A & Zinc to help support healthy skin & coat. No added artificial colours, flavours & preservatives. BAKERS(R) SMALL DOG has a new, improved recipe that is now rich in chicken, with more variety of wholesome wholegrains & country vegetables for quality, tasty goodness. And don't worry, our recipe is still made with the same amazing taste that our BAKERS dogs know & love to gobble up! This recipe has been specially formulated for your adult small dog & contains the every day nutrients he needs to get on with all the playful & cheeky things that happy & healthy BAKERS® dogs love to get up to! BAKERS new improved recipe, so that your dog can enjoy the perfect balance of taste & goodness in every bowl, every day! Daily Feeding Guidelines in grams per day Size of Dog: Toy Dog: Dog body weight (kg): 1 - 5, Daily Feed (g/day): 40 - 115g Size of Dog: Small Dog: Dog body weight (kg): 5 - 10, Daily Feed (g/day): 115 - 185g 1 = 100g One half pint mug holds approx. 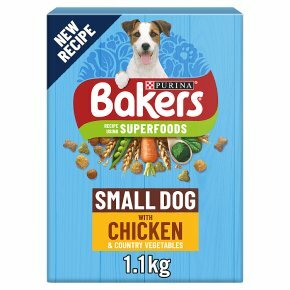 100g of Bakers® Small Dog Adult. To keep your dog in optimal body condition, adjust according to your dog's activity level, physical condition and individual needs. Clean, fresh drinking water should always be available.